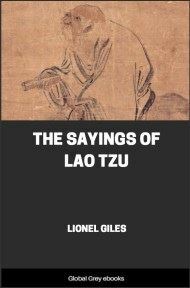 This is Lionel Giles' translation of the Tao te Ching, from the Wisdom of the East series. Giles (1875-1958) was Keeper of the Department of Oriental Books and Manuscripts at the British Museum. He also translated Sun Tzu's Art of War. A very clear English rendition of this very difficult and profound text. THE Tao which can be expressed in words is not the eternal Tao; the name which can be uttered is not its eternal name. Without a name, it is the Beginning of Heaven and Earth; with a name, it is the Mother of all things. Only one who is eternally free from earthly passions can apprehend its spiritual essence; he who is ever clogged by passions can see no more than its outer form. These two things, the spiritual and the material, though we call them by different names, in their origin are one and the same. This sameness is a mystery,--the mystery of mysteries. It is the gate of all spirituality. How unfathomable is Tao! It seems to be the ancestral progenitor of all things. How pure and clear is Tao! It would seem to be everlasting. I know not of whom it is the offspring. It appears to have been anterior to any Sovereign Power. Tao eludes the sense of sight, and is therefore called colourless. It eludes the sense of hearing, and is therefore called soundless. It eludes the sense of touch, and is therefore called incorporeal. These three qualities cannot be apprehended, and hence they may be blended into unity. Its upper part is not bright, and its lower part is not obscure. Ceaseless in action, it cannot be named, but returns again to nothingness. We may call it the form of the formless, the image of the imageless, the fleeting and the indeterminable. Would you go before it, you cannot see its face; would you go behind it, you cannot see its back. The mightiest manifestations of active force flow solely from Tao. 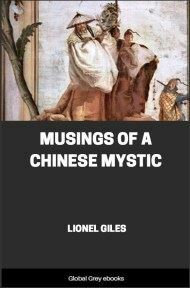 Tao in itself is vague, impalpable,--how impalpable, how vague! Yet within it there is Form. How vague, how impalpable! Yet within it there is Substance. How profound, how obscure! Yet within it there is a Vital Principle. This principle is the Quintessence of Reality, and out of it comes Truth. From of old until now, its name has never passed away. It watches over the beginning of all things. How do I know this about the beginning of things? Through Tao. There is something, chaotic yet complete, which existed before Heaven and Earth. Oh, how still it is, and formless, standing alone without changing, reaching everywhere without suffering harm! It must be regarded as the Mother of the Universe. Its name I know not. To designate it, I call it Tao. Endeavouring to describe it, I call it Great. Being great, it passes on; passing on, it becomes remote; having become remote, it returns. Therefore Tao is great; Heaven is great; Earth is great; and the Sovereign also is great. In the Universe there are four powers, of which the Sovereign is one. Man takes his law from the Earth; the Earth takes its law from Heaven; Heaven takes its law from Tao; but the law of Tao is its own spontaneity. Tao in its unchanging aspect has no name. Small though it be in its primordial simplicity, mankind dare not claim its service. Could princes and kings hold and keep it, all creation would spontaneously pay homage. Heaven and Earth would unite in sending down sweet dew, and the people would be righteous unbidden and of their own accord. As soon as Tao creates order, it becomes nameable. When it once has a name, men will know how to rest in it. Knowing how to rest in it, they will run no risk of harm. Tao as it exists in the world is like the great rivers and seas which receive the streams from the valleys. All-pervading is the Great Tao. It can be at once on the right hand and on the left. All things depend on it for life, and it rejects them not. Its task accomplished, it takes no credit. It loves and nourishes all things, but does not act as master. It is ever free from desire. We may call it small. All things return to it, yet it does not act as master. We may call it great. The whole world will flock to him who holds the mighty form of Tao. They will come and receive no hurt, but find rest, peace, and tranquillity. With music and dainties we may detain the passing guest. But if we open our mouths to speak of Tao, he finds it tasteless and insipid. Not visible to the sight, not audible to the ear, in its use it is inexhaustible. 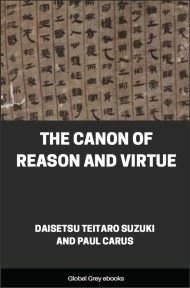 Retrogression is the movement of Tao. Weakness is the character of Tao. All things under Heaven derive their being from Tao in the form of Existence; Tao in the form of Existence sprang from Tao in the form of Non-Existence. Tao is a great square with no angles, a great vessel which takes long to complete, a great sound which cannot be heard, a great image with no form. Tao lies hid and cannot be named, yet it has the power of transmuting and perfecting all things. Tao produced Unity; Unity produced Duality; Duality produced Trinity; and Trinity produced all existing objects. These myriad objects leave darkness behind them and embrace the light, being harmonised by the breath of Vacancy.